The ailing king Karikala II of Sindura has emerged from an unconscious state of unspecified length. Wearied by the continued, violent rivalry between his two sons, he opts to have the matter of succession resolved by a duel before the gods – a ceremonial winner-takes-all one-on-one grudge match, implied to be mortal combat, where the feuding parties each select a champion and send them to the ring. 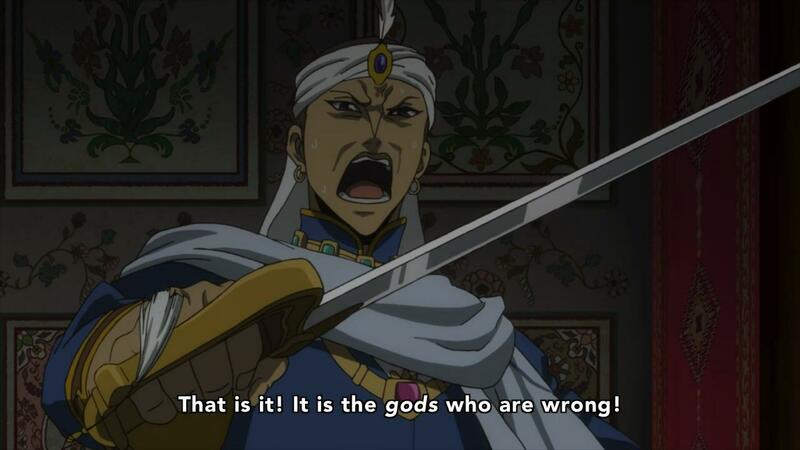 Rajendra, having observed the superlative might of Daryun in action, seeks the Parsian’s aid in securing the throne, and Arslan hesitantly assents. Surely there is no greater warrior amongst the ranks of his and Rajendra’s combined forces, but Arlsan’s worries are realized when Gadevi unleashes a monster of a man as Daryun’s opponent. All eyes are on this fight as the fates of two countries hang in the balance – who will emerge victorious? And will Brendan be able to tear himself away from League of Legends for long enough to write a cohesive review? 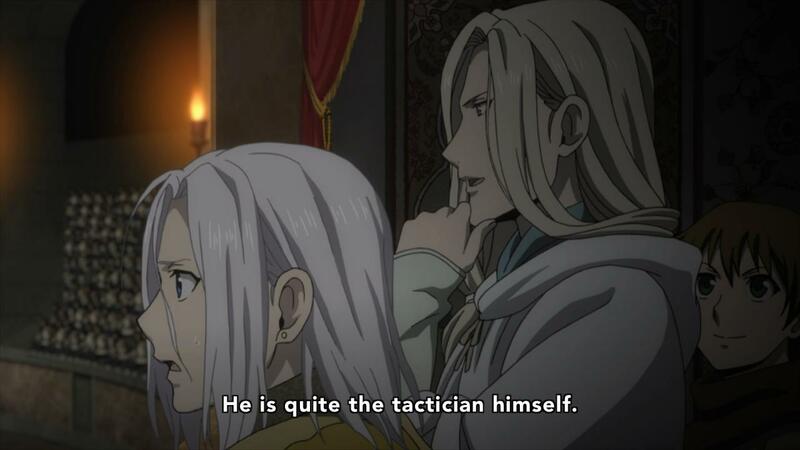 The Heroic Legend of Arslan takes tightens its focus in this episode, even as it raises the stakes. The promise to end what Daryun and Narsus themselves refer to as a detour into Sindura is a tantalizing one, and a gladiatorial match is a welcome change of pace from the recent large-scale engagements. 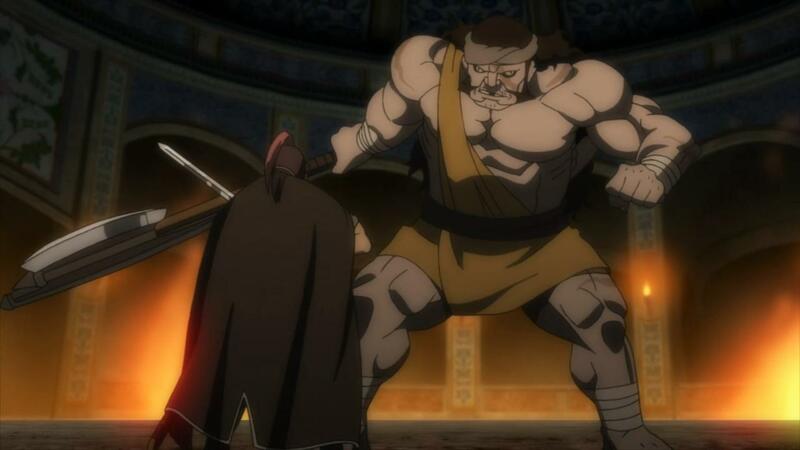 We get the closest thing to an even fight we’ve had in a while, and drama to boot, as Arslan spends the bulk of the episode worrying that he’s doomed his strongest knight / closest confidant / best friend to death in the name expediency. All around, a decent set-up. That is a huge dude. And it pays off pretty well, I’d say. The demi-human Bahadur dredged from the Sinduran dungeons provides a suitable challenge to Daryun. Narsus, for his part, makes a show of yielding his position as the source of all tactical genius, but only after his side-line gladiating at a critical moment – combined with the implication that he and Daryun had done some joint brainstorming – makes it seem like this battle, too, went just as planned. I must say that I fail to see the point of dedicating a shot to Narsus yelling “Now!” right before the cloak trick, when there’s no later indication that it was a planned contingency, nor, supposedly, that Narsus was even cognizant of Daryun’s primary strategy of luring his opponent into a false sense of security. Then why does it still look like you’re the one calling the shots? Moving on, we also get some good character moments in this episode. Notably, Arlsan blowing his top at Rajendra when he sees Bahadur’s enormous figure provides a good sense of the young man’s emotional range, and I appreciate it. 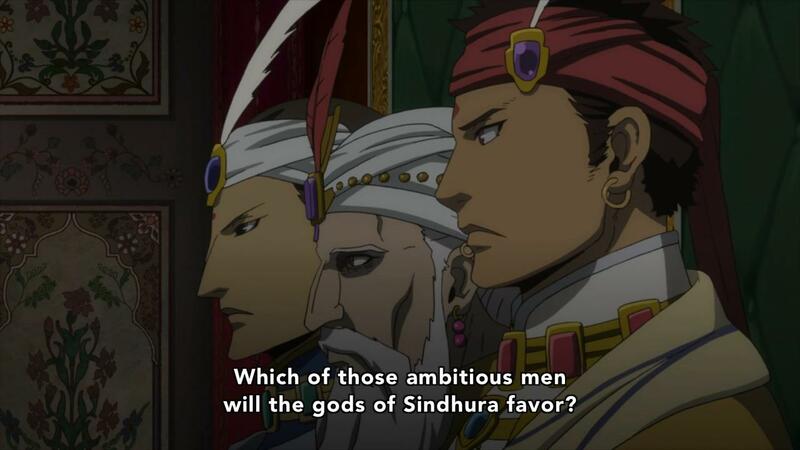 Tangentially, King Karikala may be unwilling to personally arbitrate his succession, but he’s still a long way from senile – in the same minute, he lays some knowledge on Arslan and a sick burn on his own son, Gadevi. Gadevi’s a jerk. Which is good to the extent that it means our heroes have landed on the moral high ground here. This is an episode of significant and satisfying plot progress, and is not to be missed.